MKS MINI USB Driver Chip Atmel 16us,the same as Arduino Mega2560. 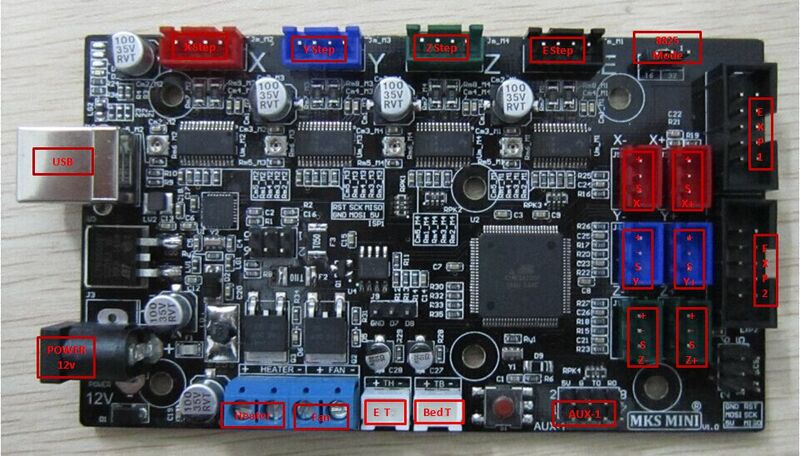 4 layers PCB, optimize heat dissipation. Recoverable fuse for short-circuit protection. You only need connect Smart Controller's Exp1 to MKS MINI's Exp1,Smart Controller's Exp2 to MKS Base's Exp2. This section will show you how to get firmware into your controller and run it with basic settings. 1.The VCP drivers will install a COM Port on your computer for the MKS MINI, you can check what port number was assigned by going to your device manager and click on Ports(COM & LPT) look for something that says "USB Serial Port(COM3)" where COM3 is you assigned port number(will vary from PC to PC). Remember this number as you will be using it later in configuring other software. 2. Install Arduino IDE - Download and extract the Arduino IDE . 3. Get your firmware - While you can use most firmwares out there, we will use Marlin as an example. Download and extract Marlin or any other forks of the firmware that you prefer/need. 4. Upload firmware - Run the Arduino IDE (arduino.exe). On Arduino click File-->Open -- then point to your Marlin Download and select Marlin.pde. With Marlin loaded on the IDE window, click on the tab that says "configuration.h". These are the basic entries that you need to change to get the X3 working. These entries are the only ones you need just to get the MKS Gen running. Once you get it to upload you can now test most features of the board. You will need to tweak the settings on the configuration file for your printer. Click on the arrow pointing to the right inside a square frame to upload firmware to the board. If everything goes well you'll see a "Done Uploading" message near the bottom of the Arduino window.